On the back of Oscar season, it is hard not to get swept up into the glitz and glam of Hollywood. Whilst for most of us, the closest we will get to celebrity status is watching e-news and reading about Brangelina in the tabloids, it makes for the perfect theme for your next event. Whether you are celebrating the birthday of a movie buff, or looking to add an element of glamour to a work function, here’s what you’ll need to host an A-list event! First and foremost you will need to roll out the red carpet for your guests (literally). Carpets can range from 3m – 10m in length so be sure to choose one that best suits the size and lay out of your venue. Set up your carpet from the entrance of the party so your guests can strut into the event like the celebrities they are. Line your carpet with bollards and red velvet ropes to give that real VIP feel. A red carpet event calls for red carpet style! This theme lends itself to a black tie or formal dress code. If you don’t think your guests will be into tuxes or gowns you could also ask them to come dressed as their favourite movie star or character. Whatever you decide – be sure to make your dress code clear and give your guests plenty of time to nail their red carpet look. With your guests dressed up to the nines, you want them to be able to show off their look for the whole night. A cocktail function will allow just that and is the perfect way to get guests mingling. Offer sparkling wine (or water) in champagne flutes or serve a signature cocktail in an old fashioned martini glass for some James Bond inspired glamour. When serving canapes be sure your guests are offered the equivalent of a sit down meal and if you really want to get into the movie theme – a popcorn machine and candy bar are a must! Decorating your space instantly adds more flare to your event. Think golds, metallics, reds and blacks – but don’t go too over board or it can look tacky. Balloon and streamer features instantly dress up a space and flashing fairy lights can give the illusion of paparazzi snapping photos. When filling your space, don’t forget about furniture. Hiring bar and cocktail tables are great for stand-up events, giving your guests somewhere to place their drink or food. The wire cocktail tables are a fancier choice and will look terrific. 5. Special guests No red carpet event is complete without some “special guests”. Stick cut outs of celebrities around the venue or black silhouette figures of photographers next to your red carpet. If you have friends that like photography, get them to take some candid paparazzi pics or let all your guests enjoy their 15 minutes of fame with a photo booth! No red carpet event is complete without some “special guests”. 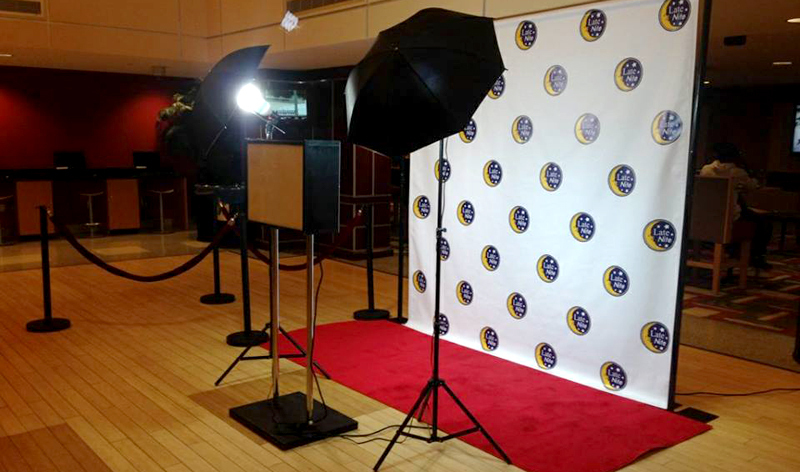 Stick cut outs of celebrities around the venue or black silhouette figures of photographers next to your red carpet. If you have friends that like photography, get them to take some candid paparazzi pics or let all your guests enjoy their 15 minutes of fame with a photo booth!